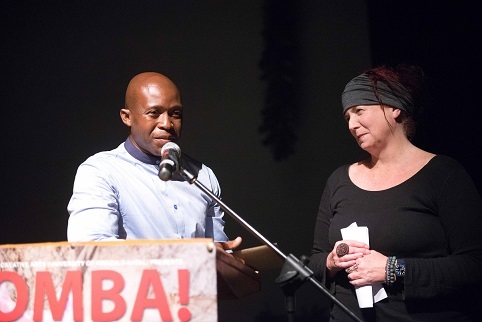 Local dance maker Mduduzi Mtshali received the prestigious JOMBA! Eric Shabalala Dance Champion Award at the Elizabeth Sneddon Theatre at the 20th JOMBA! Contemporary Dance Experience held in September, 2018, and hosted by the University of KwaZulu-Natal’s Centre for Creative Arts. Now in its 8th year, the award honours the memory of Eric Mshengu Shabalala who tragically passed away in 2011. Shabalala was a local dancer, choreographer, teacher and one of the founding dancers of the Siwela Sonke Dance Theatre in Durban. In a fitting tribute, the Centre for Creative Arts and the JOMBA! Contemporary Dance Experience Dance Festival has set up this annual award to honour some of KwaZulu-Natal’s stalwart dancers and dance teachers in his name. Speaking at the award handover, Artistic Director of JOMBA! Lliane Loots said. “The award is given not only in recognition of performance or choreographic excellence, but also more profoundly and more importantly it is given in recognition of dance practitioners who have worked tirelessly to help grow a culture of dance and dance training in Durban – who have supported the growth of dance as an art form at both community and regional level. “In selecting recipients, the JOMBA! committee look for those gifted individuals who have gone above and beyond – often without funding – to dedicate themselves to the cultural industry and to put KZN dancers and dance on the national and international map,” she adds. Past recipients of this award include Jarryd Watson, Sifiso Khumalo, Byron ‘Bizzo’ Tifflin and Preston ‘Kayzo’ Kyd, Jabu Siphika, Julia Wilson and Zinhle Nzama, Ntombi Gasa, Musa Hlatshwayo and S’fiso Magesh Ngcobo. Mdu Mtshali is a Durban dancer, choreographer and is currently the dance lecturer at the Durban University of Technology. In 1999, after completing his training at the then-Technikon Natal, he appeared with local dance companies before broadening his horizons by accepting an invitation to dance with the French dance company - Jean Francois Duroure - and travelled all over Europe and the African continent. In 2002, he also spent a year at the London Contemporary Dance School in the UK after being awarded a Rio Tinto/ Richards Bay Minerals/ British Council Dance Scholarship. After graduating, he became highly active in the national dance arena performing and choreographing numerous works. “While he is still an active choreographer and dance maker, we honour him tonight not only for his dance-making career but more especially for a long and illustrious career of over 10 years as a dance teacher and dance educator who has tirelessly given time, energy and space to train and nurture new generations of Durban dancers,” said Loots.